In many Italian restaurants, you can get a low-cost house wine (usually one white and one red selection) in carafes of 1/4, 1/2, or a full litre. In some places this is a decent though not stellar local wine, in others it will be something completely unrelated to the area. Personally, I’d try something local, even if you have to buy a whole bottle – local wines are part of the authentic Italian food experience. And sometimes the house wine is very special indeed. The house wine does not necessarily have a lower alcohol content than what you get in bottles; it has whatever alcohol content is normal for that type of wine. Is a Pizza a Meal? A normal Italian pizza is just right for one hungry person to eat – the size of a 12-14″ plate. True Italian pizza, at least in northern Italy, bears little relation to the huge thick globby thing they call pizza in the US and, for my money, the Italian version is a lot better. It’s a thin crust with a thin layer of tomato sauce and mozzarella (usually) plus whatever else you order on it – every pizzeria has a long list of options from the classic to the bizarre, but usually you can subtract ingredients just by asking. In the better pizzerie, pizza is cooked in a wood-fired oven. Don’t settle for anything less. Italians don’t often drink beer with meals, except with pizza. Beer may be on tap or in bottles, and is served by volume (piccola, media, grande). Aqua gassata (pronounced “gazata”) or frizzante (“fritz-antay”) has bubbles, naturale or non-gassata does not. While tap water is safe to drink all over Italy, Italians usually drink bottled water because they prefer the taste (not because the restaurants are looking for an excuse to make you pay more). You can insist on tap water, but be aware that in most parts of Italy it is very hard (lots of calcium), and you may not like the flavor. In some mountain locales where the local water is very good, they serve that in carafes for free. Anywhere else, it can be difficult to get tap water brought to your table, but, if you want to try, ask for acqua del rubinetto. No, gassata is not the default choice, unless for some reason your waiter has preconceived notions about foreigners. The Italian population splits pretty evenly on the gas or no-gas preference, so why would any waiter assume otherwise? NB: To an Italian, al fresco is slang for being in jail! Weather and facilities permitting, the waiter may ask if you prefer to sit indoors or outdoors. If you want to smoke with your meal, outdoors may be your only option nowadays. Prices should be the same for a sit-down meal no matter where you sit. At many/most bars you will be charged more if you occupy a table, even if you fetch your drinks/snacks from the bar yourself. Bars care about rapid turnover, so they charge you more for table service. It’s a conflict of interest between tourists wanting a place to sit down and rest their feet while enjoying the human scenery around them, and bars needing to make money from the space they’re sitting in. The more desirable the location (e.g., Saint Mark’s Square in Venice), the more ridiculous the price of a cup of coffee at a table. If you just want coffee, have it standing up at a little bar on a side street. If you want to rest your feet and enjoy the view, be prepared to pay for that. Getting the bill in an Italian restaurant can actually be an ordeal. Unlike many American restaurants, Italian restaurants are usually in no hurry to get rid of you (and most Italians would react very badly to a restaurant trying to rush them out). I don’t know why, but it can take forever to get the bill. Maybe it’s because only the restaurant owner has access to the cash register, and he/she may be busy chatting with regular customers. Note: Restaurant recommendations are here. 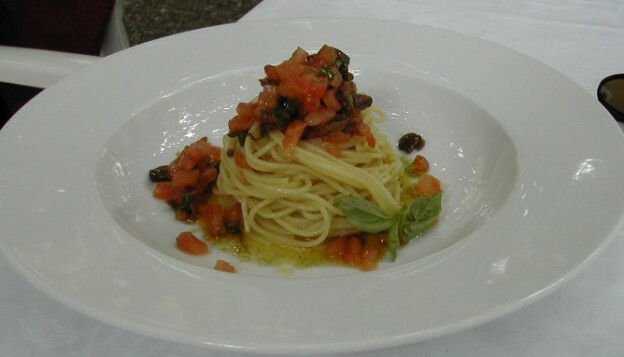 This entry was posted in Italian food and tagged dining in Italy, Italian culture, Italian food, Italian restaurants, Italy travel on April 15, 2005 by Deirdre Straughan. Question: I am on a restricted diet and cannot eat alot at a sitting. I will be traveling Italy and do not want to offend anyone if I asked for a container to take food home. Is this an acceptable practice in Italy? You’ll find that restaurant portions are much smaller in Italy, so this may not be an issue. But I don’t think anyone will mind if you ask for something to be packed up. We are currently IN Italy, and perhaps I should have looked for this information prior. We’re on land for a couple days on either end of a 10 day cruise… not overly concerned. But one problem that I would like a little guidance with is how to inquire successfully about food ingredients. My spouse has an anaphylaxis allergy to all nuts except peanuts. For simplicity we say ALL nuts however peanut oil which I understand is common place here is not a concern. Even on our flight across the Atlantic with Alitalia, when I asked the stewardess about nuts in our dinner she couldn’t tell me at all, nor was it conceivable for her to see if they COULD find out. It’s tricky dealing with any kind of special food needs in Italy; even vegetarianism is unusual and Italians tend to think that if a dish doesn’t contain obvious meat, it’s fine (i.e. – you’d want to ask it your risotto was made with a mean broth). At a dine out to a “fancy’ Italian restaurant recently someone in my party ordered risotto. It was served in the flying pan. Waiter set the pan on the table in front of the quest, handle pointing away, no other dish or plate with it. My quest ate right out of the pan. I had never seen this and asked the server. He said it was usual in Italy. True?